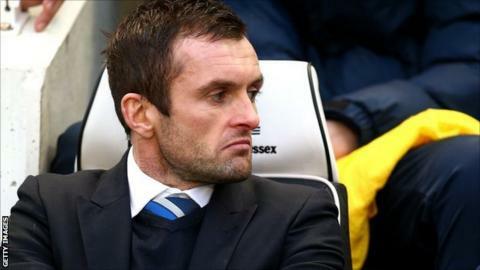 Brighton chief executive Paul Barber says caretaker Nathan Jones is being considered for the permanent managerial post at the Championship club. The 41-year-old, who was first-team coach under Sami Hyypia before the Finn's resignation on Monday, oversaw the 2-2 Boxing Day draw with Reading. "It's absolutely right we'd consider him as part of the process and we have told him that," Barber told BBC Sussex. "At the same time his immediate focus is preparing the team for Fulham." Hyypia, 41, quit as manager after one win in 18 league games. Albion chairman Tony Bloom has arrived back from Australia and Barber confirmed the club had completed a shortlist and were already talking to potential replacements. The club approached MK Dons for permission to speak to boss Karl Robinson about the job, however he told BBC Three Counties he would stay at the League One side. "There is no smoke without fire," said Robinson. "But it was a decision that me and the club came to. "It's a privilege to be linked to a club such as Brighton, but I've made a lot of promises to people at this club in the summer and I have to stick to my word. "We have games coming up against Notts County and Walsall and I can guarantee I will be in charge for those two games." Bloom reiterated the need for a swift appointment with the start of the January transfer window only days away. He has been impressed by the passion shown by Jones, who played for Albion between 2000 and 2005. "Nathan has history here as a player and is a very passionate guy, a very committed professional coach who would dearly love to step up to the top job," added Bloom. Former Crystal Palace and Stoke manager Tony Pulis, ex-Spurs head coach Tim Sherwood and former Norwich boss Chris Hughton have also been linked with the post. Jones himself admitted he had enjoyed the experience against Reading - with Inigo Calderon scoring a 90th-minute equaliser. "I love the club, I love my job and I work hard every day for opportunities in my life," said Jones. "Today was a fantastic opportunity to lead the side out. It was a great day for me and my family and I'm a greedy so and so and I wanted three points."